In this review we prove that CryptoCoinsBot is a scam that you have to avoid in order not to lose money. Crypto Coins Bot is a trading software for cryptocurrencies like Bitcoin, Ethereum or Ripple. The software works on autopilot and allegedly can make you money. How much does such a profitable crypto software cost? Nothing. Weird, isn’t it? Crypto Coins Bot costs nothing because it’s a scam. It has a hidden agenda that we will explain later. 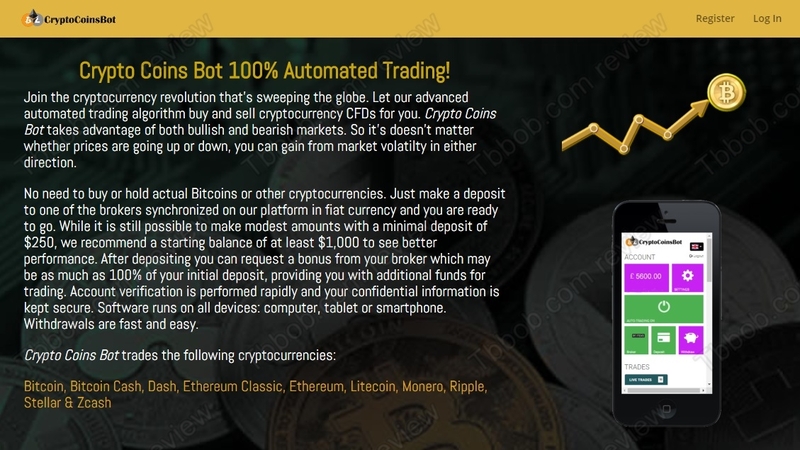 We know this trading robot very well, because it has been used by many scams for at least two years. You can have a look at our picture and see some examples of other scams based on the same software, like Auto Crypto Bot, Bit Invested and Robot Crypto Trading. 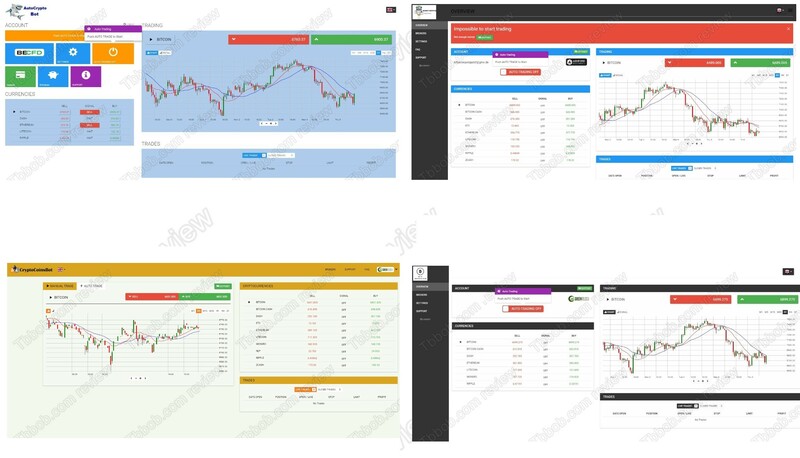 We have received tons of feedback about this trading software over the years and real users say that it is losing money. This software is very vicious, because sometimes it offers a demo mode, but this demo mode uses fake prices, so it generates fake profits that would never occur in real trading. So, beware, you cannot trust this trading robot in any case! In reality CryptoCoinsBot is not really free. Yes, you will get the software for free, but in order to be allowed to use it, you will have to deposit at least $250 with the non-regulated scam broker GreenFields Capital. This is because people who run this robot get paid by this broker for referring new depositors. The broker will take your money and you will never be able to get it back. And CryptoCoinsBot owners will get their affiliate commission from the broker. This is how it works. 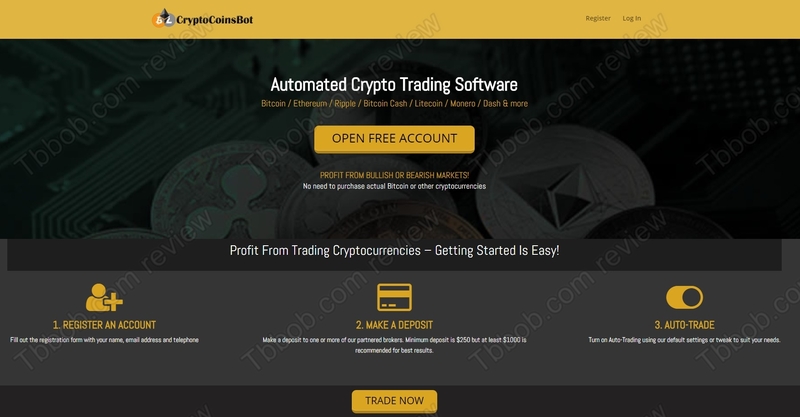 Crypto Coins Bot is an ordinary scam that will push you to deposit and lose money with a scam broker. Stay away from it! If you are interested in making money in crpytocurrency trading, start learning on a free demo with a regulated broker. You have to build a solid strategy and understand all the risks before you can start trading with real money. First of All, I see John NOWAK is a fake name ( John Nowak is an actor) . And dont Bullish with fake info to the people. I have been trading with them for a long time , made money, did many WDs so far with no problems. you are all fake trying to direkt people to the brokers that gives you comission from sending new clients. First of all, I don’t know who John Nowak is either. Secondly, we rely on our readers’ common sense to judge proofs that we provided in our review. This software is a scam that we have seen and tested dozens of times. And don’t get me started with Greenfields Capital that CryptoCoinsBot forces you to. Not regulated and scam broker that we hear complaints about all the time. Eric, it’s clearly a scam just look at their website. Do you find any imprint or information about the company? No? So you can be sure it’s a scam. I bet you’re connected in a way with this scam bot and just try to fool people reading that review.. If someone is still in doubt, do a Whois-Lookup of their domain. I bet you’ll find something like “Privacy protected” as domain owner to hide the name of the scammer. I’m to lazy to do it now as I’m already sure it’s scam..